Our laser cut memorial benches provide design and precision to commemorate those who have passed. Each bench is available with custom design options and color choices. Call today at (801) 414-1724 to start a laser cut memorial bench project. At Smith Steelworks, we create laser cut memorial benches that have the ability to portray any design the customer wants. Laser cut technology uses precise cuts to allow personalized fonts, portraits, and designs displayed through the steel. The bench will depict exactly what the customer has in mind. All benches are constructed with only the strongest, most durable steel. This gives the ability to last through the roughest conditions. Each bench is finished with a fine powder coat that provides the best look and protection for the bench. You can view all the color options here. Why Make A Memorial Bench? Laser cut memorial benches are a beautiful way to commemorate the lives of loved ones that have passed on. 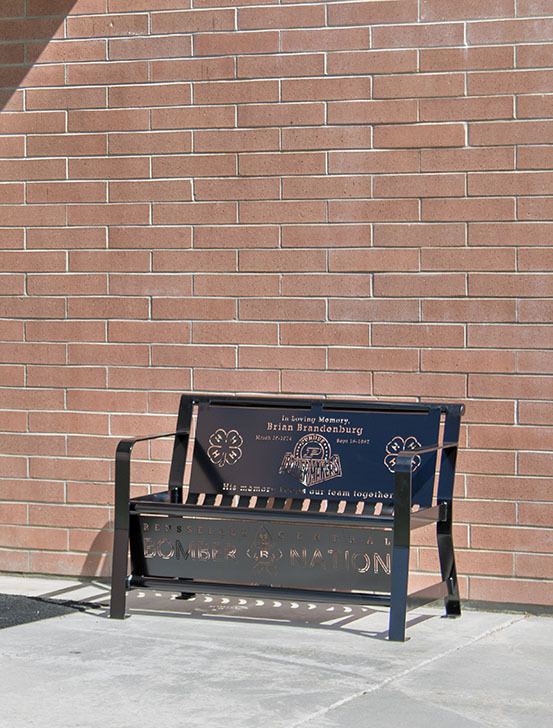 These benches allow the opportunity for community members, friends, and family to join together and remember the life of someone who impacted those around them. The laser cut benches will be enjoyed outside meaningful buildings or within beautiful local parks. The personalized and custom look of the memorial bench is completely unique to the individual being honored. Here at Smith Steel Works, we work directly with our customers to provide them with the perfect memorial bench. Once a customer gets into contact with us, we work tirelessly to turn their design ideas into a bench concept. Our talented designer will create a realistic mockup of how the finished bench will look. Once approved, the bench is laser cut, welded, and powder coated.